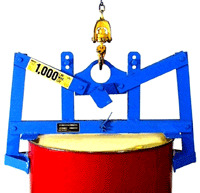 Use Verti-Karrier Drum Lifter hoist attachments to grab and lift your drum. Then move and place your drum almost anywhere. The grip will not disconnect until drum is fully down. 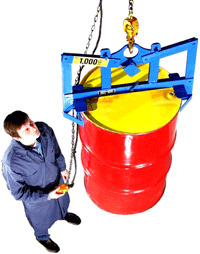 You only need to operate your hoist to guide drum grab into position. 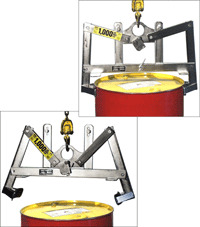 This saves operator time and protects against dangerous climbing. Capacity: 1,000 Lb. (454 kg). Each Verti-Karrier is load tested at the factory at 125% of rated capacity as per American National Standard ASME B30.20 and a load test certificate is enclosed with each unit. Rated load markings and unit identification. Minimum design safety factor of 3, based on yield strength, for load bearing structural components. Welding is performed by certified welders who have passed the ANSI/AWS D14.1 welding qualification test.